A team of Catalan Egyptologists from the Catalan Egyptology Society and University of Barcelona claim to have found one of the earliest-known pictures of Jesus in a 6th century tomb unearthed in Upper Egypt, according to a news report in La Vanguardia. 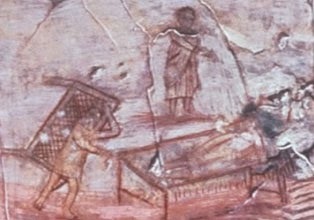 The image found painted on the wall of the Coptic Christian crypt depicts a young man with curly hair and a short tunic, with a hand raised in blessing. The team had to remove more than 45 tonnes of debris. Credit: La Vanguardia. The Healing of the Paralytic: oldest known wall painting depicting Jesus, 235 AD. Image source. 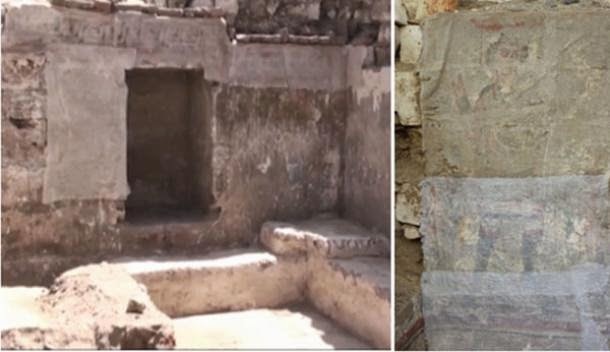 Featured image: The archaeological site at Oxyrhynchus on the left and the Coptic painting, possibly of Jesus, covered by a protective layer on the right.